For the purpose of developing collaborative support in design studio environments, we have carried out ethnographic fieldwork in professional and academic product design studios. Our intention was to understand design practices beyond the productivity point of view and take into account the experiential, inspirational and aesthetical aspects of design practices. Using examples from our fieldwork, we develop our results around three broad themes by which design professionals support communication and collaboration: (1) use of artefacts, (2) use of space and (3) designerly practices. We use the results of our fieldwork for drawing implications for designing technologies for the design studio culture. Collaboration between people, especially in teams, requires communication, about intentions, ideas, visions and knowledge. In co-located or geographically distributed work settings, co-workers apply different collaborative patterns and sometimes emit cues, traces and signals about their ongoing work—a phenomena known as ‘awareness’ (Heath and Luff 1992). The material setting within which cooperative efforts are being carried out plays an important role in supporting (or constraining) collaboration between co-workers. Similarly, in certain work environments, work-related artefacts play an important role in supporting collaboration. This is commonly known as ‘coordinative artefacts’ (Schmidt and Wagner 2002). Material artefacts such as design sketches (Vyas 2009), flight strips (Harper et al. 1989), timetables (Bardram and Bossen 2005) and architectural models (Schmidt and Wagner 2002) can translate certain intangible work practices into more visible work information that can be collaboratively utilized by co-workers during the course of their articulation work. Especially in the domain of design, much of the content may be difficult to express in words only. Design studios can be described as collaborative, highly material and ubiquitous work environments. Work at design studios involves a myriad of activities that are social, embodied and experiential in nature. A typical design studio, professional or academic, has a high material character—in the sense that it is full of material objects and design artefacts; office walls and other working surfaces full of post-it notes, sketches and magazine clips for sharing ideas and inspiration; physical models and prototypes lying on the desks and so on. The role of collaboration between co-designers is critical to a design studio’s creativity. As Engeström (2001) explains, the source of creativity is not inside a person’s head, but it emerges in the interaction between a person’s thoughts and his socio-cultural context. In design studios, communication and collaboration between co-designers rely as much on different visual and physical aspects as they do on verbal aspects. During a typical collaborative design session, the type of information that is communicated between designers is multimodal, multisensory, ubiquitous and touches the artistic, emotional and experiential side of the designers’ thinking, in addition to their instrumental and practical reasoning. 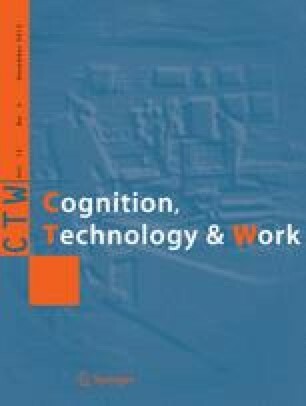 Though research in HCI and CSCW has increasingly started focusing on the design of interactive and collaborative technologies, ‘design as a profession’ is largely untouched as a subject of empirical study, with a few exceptions such as Jacucci and Wagner (2003), Schmidt and Wagner (2002), Robertson (1997) and a CSCW journal special issue edited by Eckert and Boujut (2003). As a part of the creative industry, design may not be easily formalized or rationalized to a specific set of activities, tasks or other kind of stereotypes. For example, traditional ways of communicating and collaborating may not be so important for the design profession (as we will see later in this article). Designers’ way of thinking focuses on quickly developing a set of satisfactory solutions, rather than, producing prolonged analysis of a problem (Cross 2006). Hence, there is a need to understand how designers differ from other knowledge workers in terms of their working practices. In order to better support designers’ work and to develop new collaborative technologies, we need to understand how collaborative practices of designers enable creativity in their everyday work. Weiser’s (1991) vision on ubiquitous computing projects a world where computation would be embedded into our everyday objects—not just physically but also socially and procedurally. We believe that to be able to support this vision in the design studio culture, we need to study the everyday practices of designers, the tools and artefacts they use and their social interactions amongst each other. An empirical investigation is required that specifically looks into the ubiquitous, collaborative and material nature of design practices. In this paper, we provide results of a longitudinal ethnographic fieldwork in academic and professional design studios. Parts of this fieldwork, focusing on different issues, have been published elsewhere (Vyas 2009; Vyas et al. 2008, 2009a, b). The current article combines different issues presented in earlier publications, with significant additions of new examples and analysis. The aim of this fieldwork was to explore and collect a set of important implications for designing a ubiquitous computing system that can support communication and collaboration amongst co-designers. In particular, we focused on designers’ practices that go beyond mere task-oriented and productivity-related aspects and encompass experiential, creative and inspirational interactions. We believe that this kind of approach is appropriate in the context of the design studio culture, as designers are involved in creative, inspirational and aesthetical activities that cannot be adequately addressed by functionalist view point. Our fieldwork included both academic design studios and professional design studios, involving participants from master’s level to experienced designers. We studied two academic industrial design departments and a set of design companies over a period of 8 months. Using examples from our fieldwork, we develop our results around three broad themes by which design professionals support collaboration and communication: (1) use of artefacts, (2) use of space and (3) designerly practices. The theme use of artefacts represents a set of practices that involve the use of artefacts in order to support and convey understanding amongst a group of designers. The theme use of space refers to a collection of ways designers utilize their physical space within design studios to support communication. The theme designerly practice refers to a collection of practices—that are very specific to the design studio culture—that supports designers’ collaborative practices in their ongoing work. These broader themes encompass functionalist and instrumental aspects related to design activities as well as inspirational, aesthetical and experiential factors that are important to aid creativity in the design profession. These themes are not mutually exclusive; on the contrary, their combinations are frequently used, and they are frequently complemented by the other generic ways of communicating, such as, talking, looking, overhearing and so on. In the rest of this article, we will first briefly describe the nature of design studios and list some related work on studying design practice. Next, we provide details of our ethnographic fieldwork in design studios and describe the results. In the end, we provide implications for designing ubiquitous computing technology in the design studio culture. The concept of studio-based work has been central to practices as well as education within design disciplines such as architecture and industrial design for over a century (Fallman 2007). Although it would not be easy to provide a complete picture, a typical design studio (Fig. 1) has a high visual and material character—in a sense that it is full of material objects and design artefacts; studio walls and other less permanent vertical surfaces are full of post-it notes, sketches, posters and magazine clips for sharing ideas and inspiration; physical models and prototypes lying on the desks, amongst other things. Many of the objects in a design studio may have seemingly little to do with the projects at hand, but in fact serve to challenge and inspire new ideas, to create cross-contextual reminders that lead to breakthrough thinking and conceptualization (Blevis et al. 2007). 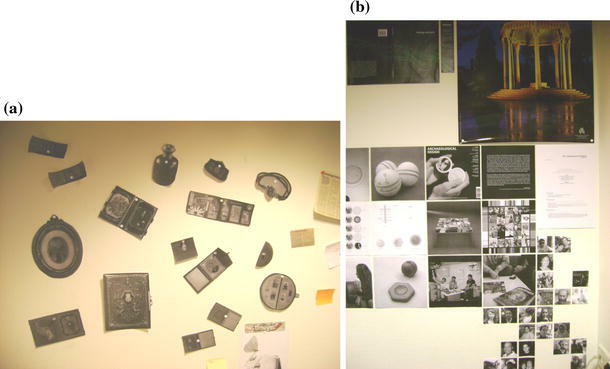 The physical surroundings of a design studio and the persistence with which different material artefacts are arranged and represented are important to the design activity and serve as organizational memory (Ackerman and Halverson 1999) and distributed cognition (Hutchins 1995) for design teams. This ecological richness of design studios stimulates creativity in a manner that is useful and relevant to the ongoing design tasks. The studio space is important for supporting and inviting design critiques (Uluoglu 2000) and the strongly ingrained designerly practice of showing work and eliciting feedback early and often (Cross 2006). Such practice encourages discourse and reflection during the design process (Schön 1983). Moreover, in design studios, much of design work is collaborative and group-oriented and the physical nature of design studios can easily afford group-orientation and collaborations. Overall, we believe that the physical setting of the design studio is typically meant to emphasize and stimulate communication, collaboration and sharing. The spatial aspects of design studios promote a style of learning that is based on continuous dialogue, conversation and critiquing on each other’s work. Additionally, when designing interactive products, designers do not work in a stereotypical or mechanical fashion. Designers tend to be innovative, creative and often playful in order to collaborate and successfully meet the demands of building new products and services. As Lawson (1979a, b) puts, designers use ‘synthesis’ when it comes to problem solving, whereas traditional scientists use ‘analysis’. Designers’ way of thinking focuses on quickly developing a set of satisfactory solutions, rather than, producing prolonged analysis of a problem (Cross 2006). Keeping this in mind, the design community has been working on developing tools [e.g., Electronic Cocktail Napkin (Gross 1996)] that do not demand great effort, commitment or precision and allow quicker production of their design ideas. Instead of using optimization in their work, designers use methods by which they can produce a set of results, all of which might be satisfying a given problem or a problematic situation. As a result, designers frequently use and produce relatively high number of representations such as, design sketches, drawing, story-boards and collages, amongst other things. Moreover, methods frequently used by designers such as role playing (Boess 2008), body storming and design choreography (Klooster and Overbeeke 2005) are not limited to problem solving but also include understanding interactional, aesthetic and experiential qualities in designing interactive products. A much more detailed account of designer’s work practices is provided in Nigel Cross’s (2006) seminal text—Designerly ways of knowing. When people collaborate, their communication and coordination acts go beyond linguistic signals and involve the use of material artefacts, locations and physical spaces (Clark 2005). Verbal language alone is not enough, and in many situations artefacts such as pictures, gestures, stories and even collections or lists allow expression of the “unpronounceable” (Eco 2009, referring to Homer). In fact, CSCW studies have increasingly shown the importance of material artefacts in coordinating distributed and co-located work (Hutchins 1995; Schmidt and Wagner 2002; Sellen and Harper 2002). Several authors (e.g., Kidd 1994; Kirsh 1995; Vyas 2009) discuss how individuals intelligently make use of physical space and its affordances, in order to establish communication within a group. In the following, we provide a short review from the literature of design studies focusing on the importance of (1) design studio space, (2) material design artefacts and (3) bodily conducts. (1) European projects such as DESARTE (Büscher et al. 1999) and ATELIER (Jacucci and Wagner 2003; Schmidt and Wagner 2002; Ehn et al. 2007) have primarily focused on understanding and designing computational tools for design and architecture studios. The DESARTE project aimed at studying the spatial dimension of design studio settings and on its influence on the practice of the design community, as well as on the way people interact within and across project teams and with external visitors and customers. Their ethnographic studies explored that the sense of ‘place’ is not directly related to the perception of its spatial dimension, but rather to its capacity of bringing forth its main features from the practice point of view (De Michelis et al. 2000). Results of their ethnographic studies have provided useful insights into the ‘customizability’ of physical workspaces. These studies focusing on architectural design studios refer the ‘communicational’ role of space in design studios. The results of their ethnographic studies were used to design Wunderkammer and Manufaktur—a set of 3D environments to provide digitally enhanced design settings (Büscher et al. 2001a, b). The ATELIER project had an aim to design ubiquitous computing tools in architectural design studios to enhance learning and design practices, in general. The ethnographic studies of Jacucci and Wagner (2003), within The ATELIER project, focused on integrating ubiquitous computing technologies to support students’ embodied interaction and to contextualize these technologies to architectural design situations. Their ethnographic research illustrated the importance of material richness and diversity of material artefacts. They also registered the distributed character of architecture learning and the use of space as a resource for collaborative interactions. Allen (1993) studied the effects of physical layout on the probability of interaction in research laboratories and product development firms. His results showed that the relationship between the probability of two people interacting and the physical distance between them was strongly negative (r = −0.84). In some cases, research has also illustrated that ill-considered construction of design studio space could lead to a negative impact on designers’ creativity (Leonard and Swap 1999). As John Seiler points out, “buildings influence behaviour by structuring relationships amongst members of the organization. They encourage some communication patterns and discourage others. They assign positions of importance to units of the organization. They have effects on behaviour, planned or not” (Seiler 1984). Agility and flexibility in design studios are also found to be important in some of the studies. The book by Horgen et al. (1999) refers to the flexibility in design studios as ‘workplace making’. The authors suggest that workplace making is a continuing effort of improving and changing basic assumptions about work practices and physical workspace to suit the current needs of design projects. They call for design studios that are much more flexible and adaptive to designers’ needs. Agility is another aspect that is seen as designers’ ability to quickly respond and effectively make rapid changes in an uncertain situation. In the design studio context, the readiness-to-change physical settings are seen to be imperative. Exploring the success of a well-known design company called IDEO, Kelley and Littman (2001) suggest that despite the fact that all IDEO offices have a similar feeling and layout, “one can easy tell it’s an IDEO office, each office creates and enacts a distinctive environment. The team dynamics changes with projects, and thus, there is a continuing rearrangement of teams, project spaces and neighborhoods.” To the authors, the flexibility of these spaces is enough to support IDEO creative practices. Kuhn (1998) suggests that physical space of architectural studios should be arranged in a way so that designers can (1) deal with open-ended problems, (2) carry out rapid design iterations, (3) use heterogeneous media, (4) support formal and informal critiques and (5) making creative use of constraints. Schön (1983) seminal work conceptualizes designing as a kind of experimentation that consists in reflective ‘conversation’ with the materials of a design situation. He suggests that this reflective practice involves a continuous process of seeing-moving-seeing (Schön and Wiggins 1992). Schön’s work does not explicitly make a case for the importance of physical space of studios, but a certain organization and arrangement of design studio spaces can greatly support reflective practices. (2) The study of Sachs (1999) suggests that in traditional practices of architectural and design students, the emphasis in the studio is placed on progress in the creation of the design artefacts and the required representations of it. Hence, progress is expected to be visible as a list, or sequence, of design artefacts such as drawings, sketches, storyboards and models—each expanding upon the information in its predecessors. Design artefacts often used and produced during design practices such as paper drawings, physical or graphical models can serve as representations of a cooperative work. Once design artefacts are attached to the space, the materiality, stigmergy, public availability and knowledge landmarks of these artefacts help in supporting communication and coordination amongst design teams. Schmidt and Wagner (2002), in the context of architectural design studios, developed the notion of ‘coordinative artefacts’ by illustrating how coordinative nature and resourceful materiality of artefacts such as architectural maps, 3D models and CAD plans make design artefacts amenable to coordination. Work of Perry and Sanderson (1998) in two different engineering design companies showed that the design process was tightly bound up with the creation and modification of a variety of design artefacts. In particular, the authors show that the ‘public’ representation of these artefacts played an important role in supporting intra-group communications. Interestingly, Robertson (2002) has specifically focused on the role of ‘public availability’ of artefacts from Merleu-Ponty’s phenomenological viewpoint and attempted to establish relationship between awareness, perception and public availability of artefacts. The materiality of design artefacts can greatly support collaborative creativity in design studios (Jacucci and Wagner 2007). The communicative, engaging, perceptual capabilities of material artefacts make them richer not just informational viewpoint but also experientially and aesthetically. Material artefacts let designers experience though seeing, touching, smelling and using other motor skills. The analysis of Jacucci and Wagner (2007) shows that materiality supports intuitive and simultaneous manipulation, mobilizing our tacit knowledge and enabling participation. Focusing on the work practices of graphics designers, O’Neill et al. (2008) ethnographic results revealed that designers build up practical, tangible, visual understandings of colour and suggested such an understanding of colour schemes is not supported by the current technologies. They claimed that current technologies required designers to deal with colour in an abstract manner. They provided several important directions for developing colour management workflows for graphics designers. (3) Amongst the empirical work on understanding design practices, Tang’s (1991) classic study focuses specifically on collaborative drawing, using observational video-tapes of three to four people collaborating at a table. Tang identifies several features of collaborative work activity that should be taken into account when designing collaborative technologies. These are: (1) the importance of gestures as non-verbal linguistic elements, (2) drawing space as a resource for communication and collaboration, (3) the importance of the process (as a discourse) of collaborative drawing itself (instead of the final result), (4) recognizing the mix of simultaneous activities and (5) the spatial orientation of collaborative workers. Focusing on distributed design projects in industrial settings, Robertson (1997) develops a taxonomy of embodied actions of designers. She suggests that the public availability of different artefacts and embodied actions of distributed participants in a cooperative process could support communicative functions. She also argues that flexible and mobile access to the publicly visible information could improve coordination. 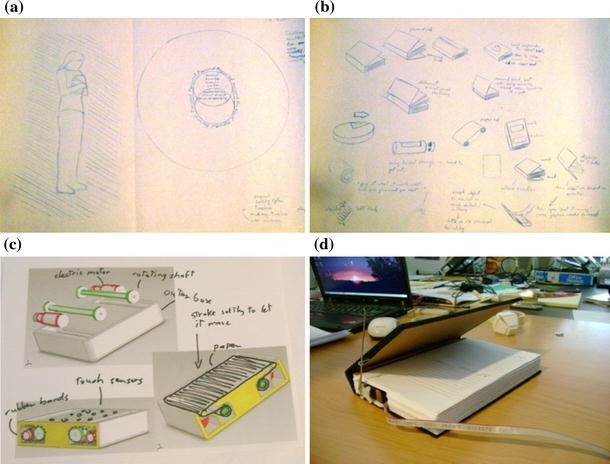 Hornecker (2002) uses an experimental setup where a group of co-located participants uses an assembly of three-dimensional objects in order to carry out paper prototyping as a design activity. Generating implications from a set of video-recorded paper-prototyping sessions, her goal is to develop a graspable interface using table-top display technologies in order to support co-located design work. She focuses on the role of embodied actions such as use of gestures, parallel activities of participants and alignment of gestures with design artefacts and talks. Our main intention behind studying design studios is to explore possibilities for a new ubiquitous computing technology that may be suitable for the culture of design studios. We do not seek to find out new sociological facts and phenomenon related to design practices, rather, our investigation is focused strictly on exploring ideas and possibilities for the design of a new technology. Our fieldwork seeks to study designers’ and their work practices in their natural environments, especially the methods and approaches they apply. Our field study is aimed at analysing detailed accounts of designers’ situated work practice. In the following, we discuss our approach and methods used in the fieldwork. In a co-located work setting, participants, while being involved in their own activities, emit cue, signals and traces of their actions in a way that co-workers can be aware of each other’s work and coordinate the ongoing joint effort by adjusting and modulating their own activities. However, as the studies on design practices showed (Jacucci and Wagner 2007; O’Neill et al. 2008), work in design studios goes well beyond productivity measures. Designers involve in several experiential and aesthetical processes such as exploring and playing their materials and design artefacts, communicating empathy of their field visits to colleagues and immerse themselves into participatory and role-playing methods, amongst a large set of other activities. We seek to explore the mechanisms designers use to support communication and coordination of their ongoing design project. Actors’ collaborative practices are greatly constrained by material and physical properties of their work environments. In our approach, we focus on the material and physical aspects of design studios and how these support designers’ collaborative practices. We believe that such an approach could be very fruitful since we are interested in designing ubiquitous computing (Weiser 1991) technology in the design studio culture. In order to develop efficient and effective ubiquitous technologies, we need to have a wide range of understandings of the ways in which the design artefacts, for example, are used within the everyday practical design activities. Collaboration in design studios requires mutual understanding, which has to be based on much more than just verbal language, so the analyst needs to identify other “languages” and “notations”. To be able to explore communication in design studios, one needs to understand the naturalistic view on how design is practiced in design studios. Ethnography (Button 2000; Ball and Ormerod 2000) is often used to study social interactions and work practices in organizations. We studied industrial design departments at two technical universities and a set of design companies in the Netherlands. Our access to the design studios in companies had some time-bound limitations, and whereas our access in academic design studios was open and prolonged. This has been reflected in our methods, observations and the data we collected. Detailed description of our participants and methods can be found in Table 1. In our investigation, we studied designers and design researchers as well as students who were involved in masters programs. Our ethnographic fieldwork lasted approximately 8 months, with nearly 250 h spent in the field. We used three methods for studying designers’ everyday practices: naturalistic observations, contextual interviews and video-recorded collaborative design sessions of designers and design students. In the naturalistic observations, we studied the collaborative aspects of the design studios. Our goal here was to understand the natural circumstances of designers’ collaboration, the tools and methods they use, and how the creative process of design is achieved. 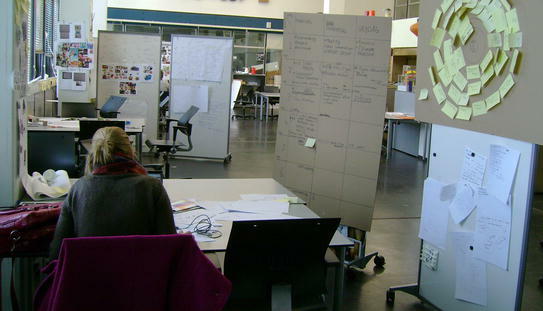 In this case, one of the authors spent several hours observing designers’ work and their collaborative design sessions, by taking notes and pictures. In the contextual interviews, we asked 10 Master’s students of industrial design and 5 designers/design researchers to participate in the study. We asked questions on individual ways of designing and on how designers understood creative ways of working. We asked how they brainstormed, what methods they used to come up with a design concept, how they conveyed ideas to each other, their preferred tools for designing, the perceived advantages of using such tools and so on. We took opportunities to record design sessions of groups of student designers. In some cases, we were participant observers collaborating with design students and recording their design proceedings. We were also allowed to record live design sessions in a design company. All interview and observation notes were reviewed, and video recordings were analysed to explore important patterns. The data were discussed within our research team, and an affinity diagram was created to explore immerging patterns in our data. We developed three themes from our data that will be presented in the next section. From our fieldwork, we explored different collaborative practices that we have categorized in the following three generic themes: (1) use of artefacts, (2) use of space and (3) designerly practices. Material design artefacts such as sketches, drawings, storyboards, collages, cardboard, clay or foam models, physical prototypes and their different manifestations during design process play an important role in supporting coordination of ongoing work between co-workers. In general, use of artefacts can be seen as externalization of thoughts, ideas and concepts on a range of physical media. Designers’ externalizing practices vary over time (at different stages of design), in modality (from paper sketches to physical models), in purpose (exploratory or definitive) and are subject to individual preferences. In a single design project, design practitioners produce and use a plethora of design artefacts to support their work. Within the context of industrial design, a design artefact can be seen as a ‘mediator’ as well as a ‘product’ of cooperative design. When we talk about artefacts, in the rest of the paper, we mainly refer to physical artefacts with three-dimensional shape and material qualities. Schmidt and Wagner (2002) argued that in CSCW research, the term ‘artefact’ is used also in mentalist and cognitivist sense, which may be confusing when understanding the actual material practices. Hence, when we talk about artefacts, these are material artefacts. Design practitioners use and produce a plethora of material design artefacts to support their work. In the case of product designers, these design artefacts can vary in representation and modality and range from paper sketches, drawings, storyboards, foam and cardboard models and so on. An analysis of design artefacts produced during a collaborative product design project can lead to useful information for understanding the coordinative practices of designers. As such, the use and manipulation of these artefacts is not a given, neither do these artefacts exist objectively in designers’ everyday practices, but they are constructed in and through the process of design. Additionally, artefacts can be seen in two different ways: artefact as a tool to support work and, artefact as a representation of work. Artefacts such as a drawing board, scale, pencil and others are used as tools to support designers’ work, whereas artefacts such as a design sketch, clay or 3D model can be considered as representations of the design process. A design cycle cannot be strictly defined but it is a process, often iterative, that habitually starts from defining a problem or brainstorming and ends at a point where a final working prototype is produced. Our observations of different collaborative design projects showed that during design cycles, design artefacts play a pivotal role in supporting communication and coordination between co-designers. In the following, we will (1) use a design project that we observed as an example to describe the way design artefacts help in supporting coordination and (2) describe how, in a design cycle, the role of these design artefacts go beyond supporting productive and task-based activities and encompass the ‘experiential’ aspects of design. (1) We will provide details of a collaborative design project carried out by four master’s students working towards developing a healthcare technology for elderly population. The project was a 4-month assignment, as a part of students’ academic degree, where they had to design a working prototype of a technology that helps elderly in their medication intakes. We followed the students’ collaborative design sessions and also took into account their individual activities. At the end of the project, we collected a large number of design artefacts produced during this project. In the following, we provide our analysis depicting the importance of design artefacts. Figure 2 shows a few examples of design artefacts pertaining to the collaborative design project. As can be seen here, the design artefacts varied in their modality, scale and materiality. Figure 2a shows four different versions of the software interface which needs to be manipulated by a remote control, Fig. 2b shows a technical drawing of the remote control, Fig. 2c shows physical models of the system, and Fig. 2d shows a software prototype being tested in the field. The following is an excerpt from the final group interview. It shows the primacy of design artefacts in supporting decision making and coordination. We started off with brainstorming and then made some sketches about different ideas. We had a list of requirements and we then tried to match these with different design sketches we had. So, we laid out the sketches on a table to be able to discuss and select one that fits the requirements and is doable…. We also made digital sketches with AutoCAD and Visio. However, for discussions we preferred the physical sketches to provide critique on each other’s work…. We made several different foam models of the remote control. We took them to the elderly people to get their informal feedback during the design process. These design artefacts also served as representations of different cooperative activities. For example, some of the sketches (Fig. 2a) described the brainstorming process that was used by the group. Additionally, these representations, in the form of a design sketch or a detailed design, carry a great number of conventions, notations and layers that can be very useful when designers collaborate with each other and allow them to extract information they need. Designers can also extract the details of notation, format and syntax underlying their form and use, such as the specific techniques involved in working with maps, charts or matrices. The important issue here is that the materiality of different design representations can afford and trigger different collaborative actions in the design team. In Bruno Latour’s (1986) terms, these representations have the characteristics of immutability and mobility. That is, these artefacts can work as a persistent form of information as well as a carrier for information that can be moved in or out of the work space in order to support efficient collaboration amongst different co-workers. The immutability and mobility of artefacts, designed or used during a design process, allow co-workers to collaborate and coordinate work amongst themselves. Another use of design representation is to establish communication amongst peers. The sketches and models that designers develop serve as a communication tool in the design team. Also, because a part of what we studied was an academic environment, it was very important for the design students to showcase their thoughts and ideas and make them visual, not only for themselves but also for other people to show what they were doing. Some of these students did work with external clients and for them it was very important to be able to communicate their design ideas. One of the students commented, “an advantage of sketching is that if I am in a meeting with a client and I can quickly show my ideas to them then, so it is very powerful in communication.” Besides just using words, physical models help designers to quickly show their clients the prototypes and models and issues that are very specific to actions and interaction. And the more examples of these external representations they have, the more useful it would be for communication with the clients. One of the virtues of these tangible artefacts (within a space that itself has material qualities) is their engaging capacity. They ask us to experience through seeing, touching, smelling, maybe also gesturing, heaving and moving. Involving all the senses is to do with richness of ‘informational cues’. The multi-modality supported by these design artefacts provided an understanding of the design practice that might not be conveyed through sequential text or speech. Considering different stages of any design process, designers routinely produce different models of the product they are trying to build. This could range from a conceptual stage in a sketch, to a card-board model, to a full prototype. Figure 2 can also be seen as examples that provides indication about different levels of multi-modality of the design artefacts. As can be seen in the figure, the multi-modality of these artefacts involves two-dimensional hand-made drawing (Fig. 2a), three-dimensional physical object (Fig. 2c) and a software-based representation (Fig. 2d). It is important to note that these variations influence the properties of a representation and suggest or enable different usages, interaction styles and variations in meaning, even when they represent the same object, idea or concept. Each of these models can be seen as having a specific ‘mode’ of expression, when put together these models form a multi-modal representation of the design concept. The materiality of these artefacts connotes a variety of qualities that are connected to the designers’ senses (vision, sound, smell or touch) and varies with parameters such as weight, thickness, transparency and so on. It is this multi-modality that turns the materiality of an artefact into a source of multiple channels of interactions that could lead to rich experiences. During the course of design process, artefacts go through many changes. The temporality of different material artefacts could help establishing an understanding of the process that is used in the cooperative design work. Because of the iterative nature of a design process, temporality becomes especially relevant since there will be a need to understand, explain and mediate the design activities involved in it. The materiality of these representational artefacts could provide a great deal of information about the way they are created, used and manipulated, conveying the process that is applied in designing. Importantly, the temporality serves not only as indicative of different stages of a design process, it also serves for accountability (planning, managing, budgeting and so on) of the design work. A thorough insight into different artefacts produced during a design process could lead to some indication about change of plan, change of methods or any other deviations during the cooperative work. Especially in the collaborative design processes, these artefacts provide cues and signals for the co-workers to appreciate the intention of colleagues and the challenges and problems that are faced by the others. The temporality is indicative of the design-in-progress which is of a great importance in cooperative work. (2) Our observations in design studios showed that the role of design artefacts goes beyond communicating and coordinating task-based and productive information and encompasses experiential aspects of design. During our fieldwork with designers, researchers and design students, we found that it was important to understand the experiential nature of artefacts at three levels of a typical design cycle (Fig. 3): exploration, communication and use (Vyas et al. 2009a, b). Exploration level refers to an early stage of design where designers or design researchers use different methods to understand the problem and the situation that they are designing for. Communication level refers to the phase where designers collaboratively develop ideas and concepts using different methods and techniques. Use level refers to the phase where designers try to evaluate and test their ideas and concepts amongst themselves and with prospective users. There are blurred boundaries between these design levels, and it is only in order to associate different artefacts with these design phases that we apply this kind of classification. As can be seen in the figure, there is a list of material artefacts associated with these three phases of design. There are mainly two types of artefacts, those that are already in the environment and those that are created by designers. We take both into account in our analysis. We believe that an understanding of the experiential role of material artefacts could lead to a detailed analysis of designers’ practices. In the following, we will discuss the three levels. From our fieldwork, we observed that design practitioners take into account workplace artefacts, socio-cultural artefacts (within domestic settings) and the life cycle of these artefacts. These artefacts are already in the environment and the way they are organized, arranged and maintained informs designers about how these are experienced by people. In some cases, user-generated artefacts produced during different design exploration methods such as participatory design or a cultural probes study (Gaver et al. 1999) also inform designers about people’s experiences. These artefacts represent and embody users’ expressions, performance and reasoning of their everyday life. In the exploration phase, to a certain extent, design practitioners try to develop a sense of empathy with users through these artefacts. These artefacts bring about dialogical effects confirming the physical, emotional and conceptual realities. These artefacts may not be seen as isolated objects indicating aspects of users’ experiences, but these are evidences of the happenings that are related to social and cultural circumstances. In this phase, we observed how material artefacts, which are created by designers as design representations, such as sketches, story-boards, mood-boards, physical models and so on, help in communicating the experiential information within design teams. These artefacts help in building an experiential common ground in teams. Importantly, material artefacts such as physical models allow the designers’ direct and bodily engagement and hence broaden communicative resources by evoking sensory experiences. The multi-modality and ability to support and convey information through all senses makes the use of an artefact experientially rich (Jacucci and Wagner 2007). In the case of joint design activities, co-workers do not just interact with these artefacts when they are designing, they actually get the feeling and experience of each other’s activities through these artefacts. This really helps in the process of collaborative design in which the designers are always in search of new, creative and inspirational ideas. The communication channels that are established by these multi-modal artefacts go beyond facilitating and satisfying basic task-oriented activities. To an extent, as we observed, the whole design practice progresses through the use and manipulation of these representations and through iterative refinements of both the conceptual and physical designs of products being designed. This is the phase where designers try to develop a better understanding of what it is really like to use the products and services that they have collaboratively designed. They come up with several versions and low- and high-tech prototypes of their envisioned system and try to use and test their system themselves or they invite prospective users to use the system in their natural environment. For designers, the goal is to convey a specific type of experience through the use of the artefacts they have designed. In our fieldwork, we observed that designers needed to have quick feedback on their designs. There are two ways of achieving this. First, designers interact with each other and try to use and observe the initial experiential effects of their products. This obviously happens in an informal way. In the next step, designers go to their potential users and ask them to use the system. Trying to maintain the integrity of experience is priority here. However, the experience of the product in the current situation also adds to the overall quality of use. A final system evolves during an iterative process where designers experiment first with low-fidelity artefacts and later with functional prototypes to collect feedback on the user experience. Before arriving at a concrete design idea, designers go through innovative and iterative cycles of exploration. Designers explore new ideas and concepts at different stages of their design cycle using different material artefacts such as sketches, mock-ups, models, working prototypes and so on. These types of external representations help designers to establish a creative sensibility. For example, sometimes sketching is used for visualizing designers’ thinking as it stimulates creativity not only within their head but also with their hands. As one designer commented, “in order to make design decisions you need to do explorations and for that you need to make different levels of prototypes”. These explorations may not necessarily be about the products themselves but about the interaction and expression that designers want to communicate through the products. These explorations can be of simple interactions, for example sliding, rotating, tilting and stretching mechanisms that could be incorporated in a product. The very basis of the exploration process is experiential in nature. Designers do not use explorative processes only to solve a problem or to carry out a design task, but to try out ideas, satisfy their imagination, envision and experience creativity. We provide two examples of explorative practices from two collaborative design projects. The first project uses sketching as a tool to explore new ideas, whereas the second project makes use of material objects to explore an open-ended idea. (1) The first example was a part of a design project that aimed at developing an interactive ‘emotional diary’. Our particular emphasis in this example is on the use of paper sketching and how the use of such a routine approach helped designers to support experiential qualities in their thinking and in designing of systems. Figure 4 shows a few examples of design and concept sketches that the designers showed us during an interview session. In the following, we provide a brief excerpt from an interview with the group members of this project, where one of the team members starts with describing the concept of the emotional diary. The design team developed a large number of sketches during the course of their project. The members of the team preferred sketching as a way of exploring new ideas. One of the members commented: “Sketching could be a very quick and inexpensive way of exploring forms and interaction mechanisms that you want to use in your product.” From the above excerpt, one can see that the sketching process allowed designers to make their creative and innovative ideas visible in a quick-and-dirty way. The diary’s form factors, interaction mechanisms, and use of technology were explored by creating inexpensive design sketches. Figure 4d shows one of the prototypes that were developed by this group, where a diary is equipped with an Arduino microcontroller. The use of design sketches for easing communication difficulties and sharing creative ideas is well known (Baskinger 2008). The example here shows that in addition to communication and sharing, design sketches also play an important role in cooperative explorations of design ideas. We observed that there are things that designers cannot easily envision through drawing or sketching. They have to practically apply their ideas in different forms of physical prototypes. From a contextual interview with a student designer, we provide an example of such a design project—where the goal of design team was to develop a communication system that uses ‘sensorial cues’. To achieve this goal, the groups of designers adapted a highly creative design process which involved exploring different sensorial phenomena. The aim of this process was to create an aesthetically pleasing, unobtrusive way to communicate information utilizing different sorts of sensory mechanisms. We will provide a set of examples of material artefacts that were used to support collaborative exploration process. More importantly, we found that these explorations did not serve any direct purpose of solving a design problem but helped designers’ imagination, creativity and allowed them to be able to experience certain phenomena that are not possible via other means of explorations. Figure 5 shows four such explorative setups that this group developed to be able to visualize and select an appropriate communicative effect. Figure 5a is an example of exploring the effect of smoke and different light colours in different shapes of glass. The idea here is to explore which combination would be suitable for a given situation. This designer explains that “there are certain things that you cannot envision in a normal situation, things like “smoke”. So in order to understand the behaviour and interaction with smoke and utilizing it into design, you have to build some things and play with it. By joining the exploration of smoke with different kinds of lights, the designer explains, “even by playing with a light I can get several ideas about new ways of interacting with lights, like blinking, fading, making patterns, so expressing new behaviours through the use of lights and different colours of lights. This opens up my visualization skills and provides new spaces for design. In this case if I just sketch this smoke with light, I wouldn’t get that feeling. Here you can play with your hands, move the smoke around, this is a very different kind of design expression and gives me a different feeling.” Figure 5b shows a model to explore the pendulum effect of three small ball-like objects. The goal here was to communicate ‘urgency’. As the designer commented, “you can change the frequency or use sounds or add other types of behaviour to it. An important thing is to see what we understand of it. You can’t take this to users as this does not have any functionality. But within us designers this gives a lot of information and helps to explore new possibilities.” Figure 5c shows a model where designers aimed at understanding the behaviour of water streams from different sources. The model uses some plastic glasses with holes inside of them and different lights are beamed from outside to see how the water behaves in the bucket. 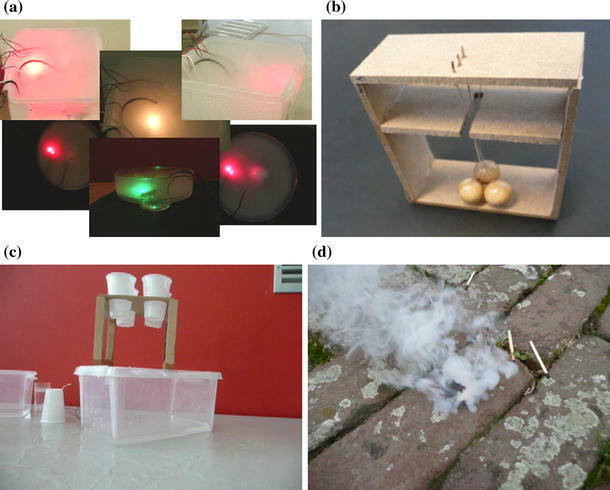 Figure 5d shows a very mundane experiment of matchsticks smoke mainly to see whether such smoking patterns would be appropriate for the designers’ needs. These explorative setups do not tell us much about what the product would look like or how it would behave. Some of the explorative models may not seem useful to others but for designers making such models could be a valuable resource for their design process. Overall, we believe that designers’ explorative practices using different design artefacts can help in establishing ‘experiential’ common ground between designers which helps their creativity, imagination and innovation processes. The material qualities of design artefacts play an important role in supporting communication and collaboration between designers. Design artefacts have a wide range of physical properties such as spatial (size, shape, proportion, location in space), material (weight, rigidity, plasticity), energy (temperature, moisture), texture (roughness or smoothness, details) as well as other dynamic properties. Designers continuously make use of the richness of material qualities of different design artefacts before arriving at the final version of their product. The material richness carries substantial experiential effects and is not only observable in the final product but also within different design representations that designers create during their practice. Using an example, we will illustrate how designers utilize the richness the material they use in their design exploration. Figure 7 shows an example of a designed product of a master’s student called ‘Afterlife object’. Afterlife object is a lighting system that preserves the uniqueness of a person by representing his/her unique DNA patterns through dynamically generated crystals on its top surface. According to the design student, this device is a new way of preserving the unique body of a loved one for reminiscing purposes. Connecting a person’s unique DNA patterns with the growth patterns of a specific type of crystals represents that something of the person is still with his/her family members. The quality and details of the product carry a lot of emotional and personal significance. The shape of the product is based on the Shinto religion. It is like a holy object that should not be held in hands and hence is developed in a square shape (and not round)—preserving its ‘reservedness’ and ‘importance’. Its external body uses the rare African Bubinga wood. 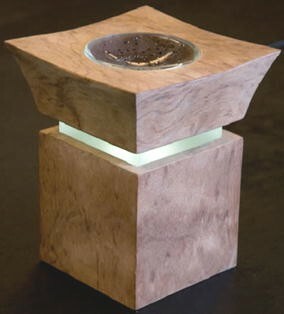 When somebody stands close to it, the device lights up and the crystal at the top surface develops a specific pattern. The object shows an afterlife of a person. The variety of materials used in this object—crystal, wood, glass, light and so on—shows the material richness that is exploited by a designer to evoke specific experiences in people. The afterlife objects are the final version of the designer’s work. This example shows how the designer has carefully taken into account the materiality and selected specific materials to fulfil his design objectives. As we mentioned earlier, the richness of materiality is also exploited at different stages of design. The Sect. 4.1.2 also describes the use of different material qualities for satisfying different design stages. We observed that material richness is utilized for exploring and playing in the design space, for externalizing design ideas and for establishing communication with different stake-holders of the design project. Space and spatial arrangements play an important role in our everyday social interactions. The way we use and manage our surrounding space is not coincidental, on the contrary, it reflects the way we think, plan and act. Within collaborative contexts, its ability to support social activities makes space an important component of human cognition in the post-cognition era. To some extent, space can be seen as a technology that we use to support our actions. The use of space has become so implicit in our everyday lives that we do not realize how it helps in our thinking, planning and other behaviour. The use of space theme refers to how design practitioners utilize their physical surroundings within design studios in order to support collaboration and creativity in their work. In the academic as well as professional design studios that we studied, we saw design teams used their office walls, whiteboards, clipboards, wooden panels and so on as carriers of their design-related information. The types of information that are attached to these spatial objects have instrumental and productivity-related functions and can be seen in the form of design ideas, sketches, to-do lists, project-related information, work-in-progress data and other organizational details. At the same time, they also carry inspirational, provocative and other non-instrumental details such as posters and innovative design sketches. We saw that the way information was represented in the space provided indication about collaborative and methodic practices of designers (Vyas 2009). This way of making work visible reminded the designers of ideas to be pursued or further developed, of tasks to accomplish, of standards, etc. It also is an important vehicle for peripheral participation in a project, allowing visitors to enter its context. Conversations are opened up; designers are forced to explain to continuously changing interactors. They can create and communicate their identity without closing it too much. Figure 8 gives a glimpse of a section of a design studio where a design team has used clipboards, large card boards and movable tables to develop a creative environment. In addition, there is information about project plan, post-it notes, design sketches on the clipboard, as well as the prototype on the table. An environment such as this establishes a ‘creative ecology’ within a design studio both at personal and social level. In the following, we will discuss how arrangements such as these help in establishing creativity. In this section, we will provide a set of examples from our fieldwork where space and spatial resources were used to support collaborative design practices. We will first provide the notion of artful surfaces—referring to the creativity and resourcefulness of designers to create a workspace that is full of design-related materials. Using examples, we will describe how these artful surfaces come about helping in designers’ everyday work. Next, we will discuss how spaces are created to support collaborative projects. Design studio surfaces such as designers’ desks, office walls, notice-boards, clipboards and drawing-boards are full of informative, inspirational and creative artefacts such as sketches, drawings, posters, story-boards and post-it notes. Studying the use of these surfaces, we introduced the idea of artful surfaces (Vyas 2009)—surfaces that designers create by externalizing their work-related activities, to be able to effectively support their everyday way of working. By artful surfaces, we mean how artfully designers integrate these surfaces into their everyday work and how the organization of these surfaces comes about helping designers in accomplishing their creative and innovative design practices. Studio surfaces are not just the carriers of information, but importantly they are sites of methodic design practices, that is they indicate, to an extent, how design is being carried out. For us, the conceptualization of studio surfaces is not limited to different physical locations or physical objects and their placement, but more a phenomenological notion of ‘place’ that interweave material, social and situated view of studio surfaces. Hence, when we talk about design surface, we do not talk about the mere physical space but an appropriated design workplace that has design artefacts such as sketches, posters, drawings and story-boards attached to its surfaces. In the two industrial design departments that we studied, we observed that many surfaces were specifically created and shared amongst a group of co-located designers and design students. The main purpose of using these kinds of surfaces was to share resources and information amongst relevant groups of people. Here, the surface itself was shared but not necessarily the informational and inspirational artefacts on it. However, there were some examples of jointly owned artefacts on these shared surfaces. Additionally, as shown by Baskinger (2008), two-dimensional design sketches are useful not only to develop a design idea, they are used for envisioning, recording and narrating ideas, sharing and reflecting both at an individual level as well as at social levels. These design artefacts can be pointed to, talked about or annotated on. Sometime, agreements are reified on artefacts. Design artefacts can function as mediators between different individuals or groups in design. As an example of shared surfaces, Fig. 9 shows a part of an office wall cluttered with different artefacts that was shared between 3 and 4 design students in a co-located setting. Since these surfaces were used by several people for different purposes, these surfaces had some form of loose organization. It is well documented in several design studies (e.g., Perry and Sanderson 1998) that design artefacts such as sketches because of their material properties play an important role in supporting communication between different designers. Figure 9 shows different labelling and patterning schemes in order to allow clear understanding of the information. It also shows coloured post-it notes indicating categories of the artefacts and annotations and comments made by co-inhabitants. In this case, the shared surface is used in a multilayered way and their portability helps in (re)arranging these artefacts. The intention of creating and using shared surfaces is not necessarily to support coordination of ongoing work but to make each other’s aware of certain ongoing activities. The surfaces also include resources from designers’ past projects. When faced with a design problem, designers apply knowledge that has been acquired in previous situations to draw references to existing solutions as inputs for their idea generation (Muller and Pasman 1996). Similar patterns were also seen in our findings where designers utilized product samples, catalogues, photographs, slides and so on from their past work and organized them into mood-boards, collages and folders. 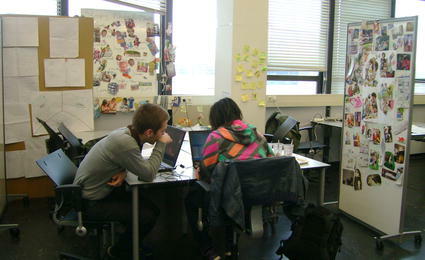 In many cases, we observed that designers and design students were working on several projects at the same time. Another reason for organizing the personal space in such a way was that unless certain design artefacts are visibly placed on these surfaces, they tend to get ‘lost’ in the mess of tasks and parameters that are normally considered simultaneously. For some of these designers, even a slight or unintended change can lead to problems in their design practices and in some cases once a design artefact is lost from the ‘sights’ of designers, it would eventually mean that the design artefact may never be retrieved again in a near future. In these cases, such an organization of personal surfaces would lead to quick response from designers in a timely pressured situation. Figure 10 shows two examples of shared space that we captured during our ethnographic fieldwork. The example on the left (Fig. 10a) shows a shared surface artfully created by a group of designers working at a co-located space. Making this a “tea-corner”, a group of design students had developed multilayered shared surfaces using wooden panels. The purpose of these surfaces was mainly educational as it included visual design guidelines and best practice schemes. This was of creation and uses of surfaces showed how design students wanted to influence and learn from each other’s design knowledge. As Downing (2003) suggested, humans learn to value certain things from their communal networks. His notion of transcending memory becomes very relevant and important here. For students, when they share their design artefacts such as sketches and posters in a visual public space, it not only helps students to understand the essence and meaningfulness of these artefacts but also helps them imagining the future concepts and design ideas by referring to that original design artefacts. In Fig. 10, the example on the right (Fig. 10b) shows a shared surface at a studio of senior designers. On a large common wall, designers kept information about their individual project works, some design posters, their calendars and work schedules, and some design prototypes of interactive photo frames can also be seen on the wall. Interestingly, one can see commonly used tools such as printer, cupboards and post boxed aligned with these design artefacts on the shared surface. This in fact increases designers’ interaction with the shared surface. We observed that the physical and public nature of shared surfaces encouraged designers and design students to easily discuss and manipulate the contents incorporated in these shared surfaces. It was seen that these kinds of arrangements were configured and re-configured in a series of different situations to which the designers can react. The examples in Figs. 9 and 10 showed a mix of different types of design artefacts placed for different purpose. By mixing narrative elements with descriptions of design ideas, a sensibility for the actual context at hand can be supported. Interviewer: “What about the other wall? 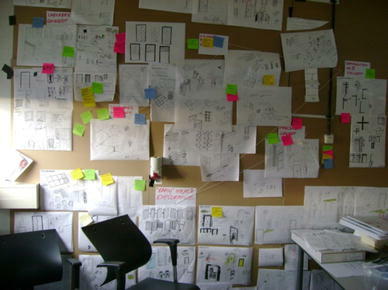 One of the walls in this designer’s office was more or less static (Fig. 11b) and the other was dynamic (Fig. 11a)—in a sense that its contents were changed over time. The static wall had artefacts ranging from inspirational sources to information about successful projects—representing a portfolio-type appearance summarizing the designer’s interests and achievements. This was an example of creating and displaying ‘social identity’. On the other hand, the dynamic wall had information about current projects, and the arrangement of these items was a bit messy. In addition, he also kept documents about his plans within projects on his office desk. Overall, the portability and flexibility of these material artefacts help designers to personalize their work environment. These types of surfaces are created by a team of designers when they work on a collaborative project. These surfaces are normally away from designers’ personal workspaces. The organization, placement and interaction with these surfaces depend on the kind of project that designers are working on. 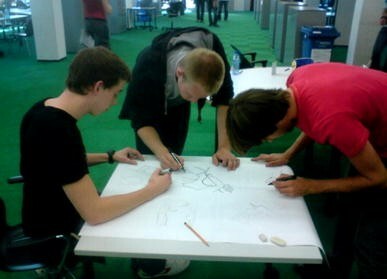 The surfaces are developed using movable whiteboards, wooden walls, tables, or a more fixed placeholders such as walls. These surfaces hold artefacts that are relevant to a specific project. Informational artefacts related to project definition, project schedule, to-do list, division of work, design concepts and sketches and so on are normally seen on these surfaces. As the project progresses, the contents of these artful surfaces emerge or change, but also diverge. Figure 12 shows two examples of project-specific surfaces. Figure 12a shows a workspace made of soft wooden sheets (created for temporary purposes) that carries information about a particular project that deals with designing an Instant Messaging (IM) system. On these surfaces, one can find information related to project description and goal, a detailed project schedule, initial sketches, related literature information and possible design concepts. Interestingly, the physical space is intentionally used to create a rich ecology of where a group of designers can completely focus on the project. Figure 12b shows another example of project-specific surface, where office walls are used to contain information related to a specific design project—designing for bus stop passengers. On the wall, one can see images of different types of bus stops, sketches about design ideas, some scenarios and a project schedule. Another important use of project-specific surfaces can be seen in Fig. 12b about maintaining a connection between the rich context of a given problem domain. As we mentioned earlier, designer use contextual and in situ methods such as ethnographic studies and participatory design to “step into the users’ shoes” get an insight of users’ world. And often, it becomes difficult to communicate this experiential and contextual information to co-workers with verbal means. By keeping visual information about study contexts helps designers to ease this communication difficulties and event help them remind about their work. So, in this example, the images of different bus stops and different design sketches related to them can provide contextual sensibilities and allow designers to focus on these contextual cues. Secondly, this also helps in visualizing and coming up with new concepts about their design solutions. The physical space allows people a kind of flexibility by which designers can make connections and associations of design sketches, images and other visual representations. Association of objects helps designers to grasp ‘abstract’ concepts. Mitchell’s (1994) observation that although an image (or idea) may be ‘abstract’, “language, narrative, and discourse can never—should never—be excluded from it” (p. 226). In this sense, association objects are used for bringing the narrative element in a concept to the fore. And obviously, language and metaphors are also used for emphasizing specific design qualities. In addition, we also observed that design teams used other forms of horizontal as well as vertical surfaces to support their collaborative design activity within an ongoing project. 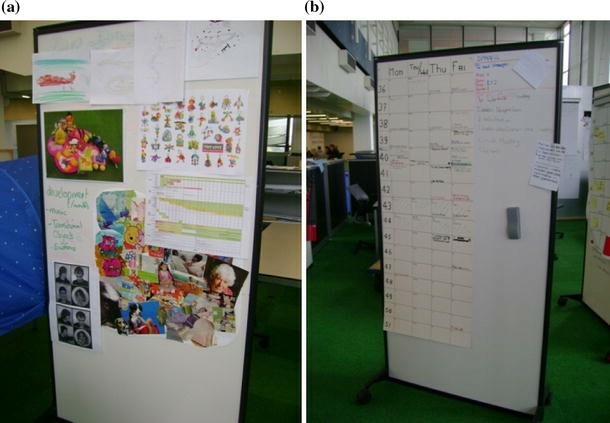 Figure 13 shows two examples of movable whiteboard, where, in Fig. 13a, a group of design students working on developing ‘an interactive toy for kids’ have kept different concept sketches, time-schedules and scribbles about desired functionalities. This kind of artful surfaces can be dragged along to different meeting places, where designers, using pens, can add or change its details. Similarly, Fig. 13b is a whiteboard with written information about project schedule, deliverables, plans and current status of the project. We can see indications of changes by co-members of the team. This kind of arrangement allows team members to constructively criticize as well as build on each other’s work throughout the duration of a project. As we can see from all these examples, the function of project-specific surfaces is largely productivity-focused. Time-management, scheduling, work progress and division of workload were the most important functions of these artful surfaces. A normal time line of this kind of artful surface is the duration of the project (2–6 months) in the case of students we observed. During the project, these surfaces allow a team to organize, manage and reflect on their work in an effortless, visual manner. The informational artefacts that are attached to these surfaces are used both in synchronous and asynchronous manner. During a group meeting, for example, designers can easily refer to or demonstrate particular design phenomena by showing or pointing to specific artefacts. On the other hand, it allows individual members of a team to leave traces of their actions when not all members are present. In both cases, this type of artful surfaces serves as mediators of social coordination. By designerly practices, we mean a certain kind of practices that are specific to the design studio culture. These practices cannot be seen from a functionalist or task-based perspective, as they do not serve any immediate purpose of solving a design-related problem. Designers apply these practices to enrich their design and stimulate creativity in their work. In our fieldwork, we observed several of these practices that supported communication and collaboration within groups of design teams. During ongoing design projects, designers accomplish activities and tasks not only through their internal cognitive processes but by utilizing cooperative ‘embodied’ actions (Robertson 1997). Designers creatively make use of their bodies while, for example, talking, explaining a design sketch to others or in referring to spatial arrangements within a design studio. While the use of gestures and other bodily representations for discussing design ideas is common in design studios, there is an increasing use of design methods such as role playing, body storming or design choreography in design groups (Hummels et al. 2007). Using these methods, designers explore and experience design possibilities for themselves, intentionally make these ideas public and allow other designers to reflect on these ideas. Here the design cooperation is achieved by the mutual perception of these actions as the basis for the ongoing creation of shared meanings in a particular design task. The use of bodies can be seen in different design stages to support different needs. In the following, we will explain how the use of bodies helps in creativity. It has been suggested that bodily movements are suitable as a design technique, as our bodies convey emotions as well as geometry and interactions (Hummels et al. 2007). Role play methods allow designers to imagine and empathize a given design challenge. A physical activity is a primary source here to explore new possibilities. In our fieldwork, we found that many of these bodily actions were aimed at better understanding of the design task context and at exploring new possibilities. Figure 14 shows two examples of exploring design possibilities. Here, the participants, using different bodily patterns, are exploring the possible behaviours of the product to be designed. The vividness of these experiences and the bodily understanding of a given design situation help designers to make better design decisions (Buchenau and Fulton Suri 2000). Our verbal languages may not be enough when communicating issues related to complex technologies. While designing new technologies or products, designers have to think about out-of-the-box ideas that may be difficult to articulate using verbal means. One of the main objectives of applying role play methods is to communicate early design ideas and concepts in an engaging and participative way that could establish common ground for the group of designers (Buchenau and Fulton Suri 2000). Additionally, many product designers need to deal with issues such as branding, marketing and advertising. Methods such as role play help in dealing with all these issues in one package—that requires a combination of functionality, expression and communication. Studies have shown that gestures, in addition to their purely communicative role, help lighten cognitive load when a speaker or performer uses them in combination with speech (Tang 1991). Through role playing, a performer’s ability to map his/her actions to certain features or tasks of design could help in understanding the envisioned product. Supporting appropriate user experience is amongst the main goals within the design profession (McCarthy and Wright 2004). Our physical bodies play a central role in shaping human experience in the world, in understanding of the world, and in interaction with the world (Klemmer et al. 2006). In addition to exploring new ideas and improving communication possibilities, we also observed that the use of role play and other participatory methods provided new perspectives on bodily experiences. When designers enact a particular scenario, they go through a set of emotional and experiential “phases” that not only make their actions personally meaningful but also lead them to envision how a potential experience should be. Designers communicate through a varied set of design representations often involving different materials, modalities and scale. To an extent, the whole design practice progresses through the use and manipulation of these representations and iterative refinements of both the conceptual and physical forms of products to be designed. Through externalization designers can visualize their ideas and concepts by actually creating them (putting things into practice) and not just by thinking about them. The physical activities and tasks that designers carry out allow them to think about the design of their products in a better way. During an iterative design process, design artefacts such as sketches or models ‘talk back’ to designers (Schön 1983). The epistemic knowledge developed during the process of constructing different design artefacts and externalizing design ideas leverages the way designers deal with elements of surprise and unexpectedness. Our fieldwork on designers underscores the centrality of ‘thinking through doing’ (or thinking through externalizing). It was observed that a single design team would collectively develop an average of 50–100 external representations of their design ideas, depending on the project. These vary from paper-based sketches or cardboard models to physical models. Because different styles and levels of fidelity of a representation yield different perspectives, meanings and experiences, externalizing ideas through a variety of prototypes affords a richer understanding of a design. Figure 15 shows an example where a particular design representation is used to support discussions. 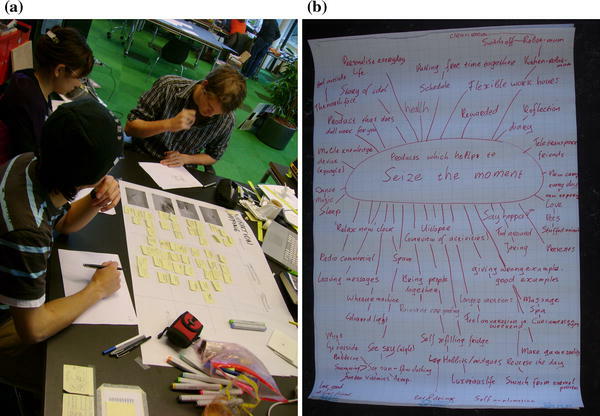 Figure 15 shows a design group using a collection of paper-based sketches with annotations on post-its attached it them. Being able to create more than one representation and alternatives of an idea and to try them out is in fact a major requirement for supporting creativity (Fischer 2004). The thinking through doing theme suggests that the effort invested in developing different design alternatives helps co-designers to compare and judge important aspects such as the difficulty of building the final product. By creative social practices, we refer to a large set of collaborative methods and approaches that designers employ in their design activities. We observed several types of these practices from our fieldwork. It would be impossible to talk about all of them, instead, we provide a glimpse of these by providing examples. Designers apply some innovative and creative social approaches to experientialize the design of their products. What this shows is that designers do not work in an orderly fashion and they are not task-oriented. During the interview session, we asked designers whether they use any check-lists, protocols or guidelines while designing their products. Strikingly none of the designers had a pre-defined way of working. According to them, since their design projects have a large diversity, ranging from designing a postcard to intelligent products and from designing a tooth-brush to automobile instruments, applying a formal and pre-specified design approach is not desirable. Different material artefacts play a role in supporting creative social practices of designers. 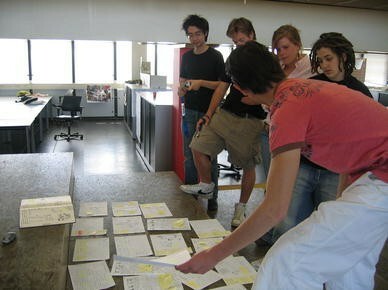 Designers use different participatory methods, generative tools, observation methods with their users and clients and use different brainstorming and discussion techniques amongst themselves in their design processes. The social processes that they apply help them to construct new design ideas. Designers use different brainstorming techniques (Fig. 16) at different stages of their design process. For example, at an early stage of design, techniques such as keyword generation, word-associations and sketching ideas on a large sheet of paper are used to get a broader perspective on design, whereas during the concept development stage, techniques such as interaction mapping, role-playing or theatre techniques are used to develop behavioural mechanisms in the product. In dealing with their users and clients, it is important that designers develop empathy with them. Clearly, it is not just about collecting data as a set of requirements and direct observations of users, but it facilitates going much deeper into understanding users’ experiences. In cases where designers cannot easily collect information from users, they try to use innovative methods amongst themselves. One of the design researchers commented, “For designing for elderly, we asked some of our undergraduate and graduate students to understand what life is like as 80 + years-old—what we call geriatric sensitivity training. 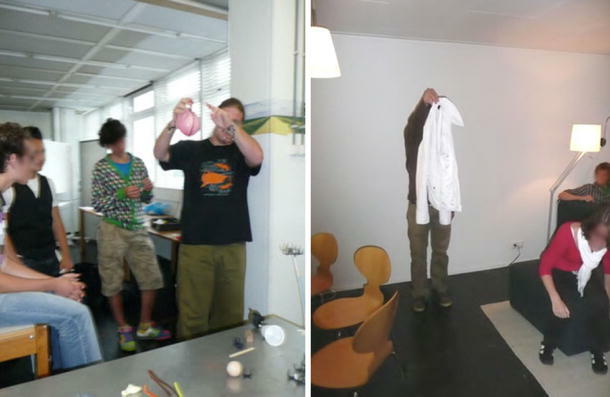 By limiting students’ physical and sensorial capabilities, they were asked to perform very generic activities. This lead to an empathy about the eye-sight, movements and range of motion of the elderly. When students developed this type of understanding, it allowed them to look through things more critically, they could deal with questions in a better way.” In a different example, some of the design students attempted to design for people with sleeping disorders by not sleeping for 2 nights themselves and getting a feeling of what it is like to be really tired and still have to finish your everyday things. One of the striking aspects that we observed in the academic design studio was the informality and ephemerality of the way design students communicated and collaborated with each other. This was certainly not considered unusual; in fact, this was expected from the students. It was preferred that students would not just sit-down and design all their products on their own. The students would intentionally move around, change the location of their work, create new collaborative spaces, play with different things in the studio, and so on. This is clearly not what we see in other, especially the more formal, work environments. As a result of this kind of practices, designers develop their own ephemeral environments as can be seen in the above two examples in Fig. 18. The advantages of these kinds of practices by designers are (a) this allows them to communicate in close spatial proximity and hence make the information publicly available to all the members of the design team and establishes common ground in the team; and (b) it provides personalization and flexibility in a sense that it can change the look and shape of the collaborative work environment. These kinds of ephemeral practices support designers’ creativity, innovative thinking and comprehensibility. Research in CSCW, in general, focuses on exploring how computing technology can be designed to support people’s cooperative activities to accomplish their work more efficiently and effectively (Schmidt and Bannon 1992). We focused on understanding the issue of collaboration that designers employ in going about their everyday work. In particular, we focused on the material and physical aspects of designers’ collaborative practices that support creativity. Our approach borrows several conceptual instruments from Schmidt and Simone’s (1996) notion of ‘coordinative mechanisms’. Their focus on the role of material artefacts is central to our understandings of material coordinative practices. In fact, the role of materiality in supporting cooperative work is well acknowledged in the CSCW literature (Sellen and Harper 2002; Hutchins 1995; Bardram and Bossen 2005; Harper et al. 1989; Schmidt and Wagner 2002). Several conceptual notions such as distributed cognition (Hutchins 1995), cognitive artefacts (Norman 1991), boundary object (Star and Griesemer 1989) and external memory, amongst others, have shown that material artefacts have several qualities that allow actors to use them more than just a retainer of information but as memory aid and a communication and collaboration tool. The field of work plays an important role on how material artefacts and other spatial resources are utilized by its actors to be able to convey relevant cues. As we mentioned in the introduction and provided evidences in our results section that in the field of product design, designers extensively utilize the material qualities of design artefacts in their day-to-day work. They also make creative and resourceful use of spatial arrangements and use design methods that are very particular to the field of product design. Clearly, a functionalist approach (Dourish and Bly 1992) to study cooperative work in this context may not be able to encapsulate experiential, aesthetical and inspirational aspects that are frequently communicated between designers. In this paper, we provide results of a longitudinal ethnographic fieldwork from different design studios. The aim of our fieldwork was to inform the design of a ubiquitous computing technology for design studios. Our results shed light on three generic themes of collaborative practices, namely use of artefacts, use of space and designerly practices. We illustrated these themes using examples from our fieldwork and showed how material and physical aspects play a role in supporting coordination in the design studio culture. The ‘use of artefacts’ theme shed light on how designers externalize their thoughts, ideas and concepts in a range of design artefacts such as sketches, collages, drawings and models, in order to support their design activities. We observed that designers’ working through and with these artefacts served both as a mediator as well as a product of cooperative design. Through examples from the fieldwork, we showed how such artefacts allowed designers’ creative explorations, offered a communication channel, established a common ground within design teams and allowed them to exploit the material richness for different purposes. The ‘use of space’ theme shed light on how designers utilized their spatial resources such as desks, office walls, white-boards and so on to support their everyday collaborative activities. We gave examples of how designers artfully organized they office surfaces and project-specific surfaces and sometimes made use of ephemeral studio areas to enable their cognitive and creative work practices. To an extent, designers’ workplaces gave an account of their methodic design practices. The ‘designerly practices’ theme provided a list of processes designers applied to support their collaborative design efforts. For example, use of their bodies in body-storming methods (Klooster and Overbeeke 2005) to gain experiential insights into the interaction design and their practice of ‘thinking through doing’ to enhance their cognitive and creative processes showed that such practices are worth looking into when studying design practices. On the methodology side, our ethnographic orientation provided us with lenses to look at cooperative work in phenomenological sense. Our approach led us to an understanding on ‘why’ do people do ‘what’ they do. Regarding the two distinct settings that we studied, academic and professional, questions may be raised about how we could reconcile the results or how we could generalize them since these are two different ‘worlds’. Firstly, since our topic of study was the design studio culture, which in fact exists in both academic and professional fields of product design. Even though, one might find difference in these two settings, a large amount of work practices remain the same. Secondly, we would like to stress that what we have presented in this paper is what normally called ‘ethnography for design’ (Randall et al. 2007). We do not seek to make claims about the field of design, per se. We seek to find plausible ways to design new technologies that can be used in a given environment. In fact, the following section will provide details of design implications that might be used for developing new technologies. In the last two decades, new breeds of interactive systems utilizing mobile, tangible and augmented-reality technologies have emerged that support ubiquitous and flexible collaborative work. In particular, several researchers (Streitz et al. 2005; Dillenbourg et al. 2008; Arias et al. 2000; Maldonado et al. 2006; Hornecker 2005; Brave et al. 1998) have pursued a particular design theme: computationally augmenting every day, mundane artefacts and work spaces in order to facilitate and enhance more ‘natural’ interactions amongst the collaborating participants. Interactive furniture, tabletop displays and other types of smart objects have been realized in recent times. Researchers have been exploring the elements that make up interactive spaces and the role of interactive, and effects these spaces have on collaboration. Different approaches have been implemented to support group work with adapted office spaces and room elements, but so far, none of these approaches alone offers a consistent solution to the question of how to integrate technologies in objects and environments in a way to support collaboration. One of the advantages of this kind of interactive systems is that since our everyday used furniture and workspaces are universal and socially already adapted and integrated, operating with this augmented system is well understood. In such scenarios, the computer disappears and objects take advantage of computational capabilities to support new usage scenarios (Dillenbourg et al. 2008). The domain of work being carried out and work practices of people situated in it also play important parts. Technologies developed for supporting design practices have mainly focused on the conversation paradigm of face-to-face interaction between meeting participants. Unlike other more formal domains of work (e.g., finance, medicine), work in the design profession has an inherent embodied and ubiquitous nature. Being a part of the creative industry, design professionals have to be innovative, creative and sometimes playful in order to successfully meet the demands of building new products and services. Their everyday collaborations go well beyond conversations and talks and involve communication of expressions, feelings and artistic reflections through design-related artefacts like sketches, physical models, prototypes and so on. The results of our fieldwork point to four important design implications that can be considered for developing ubiquitous computing technology in the design studio culture. Artefact-mediated interaction. As we showed in this paper and also echoed in other studies on design and architectural practices (Jacucci and Wagner 2003; Schmidt and Wagner 2002; Perry and Sanderson 1998) that designers develop a multitude of design artefacts in the form of paper sketches, drawings, physical models and so on over the course of their design projects. The materiality, stigmergy, public availability and knowledge landmarks left on design artefacts help in establishing and supporting communication and collaboration between designers. We believe that a technology should be able to incorporate these artefacts (at least partially) into its design space so that its natural and experiential qualities can still be exploited by designers. We believe that the ubiquitous computing research needs to focus beyond merely digitizing physical objects and take into account the material qualities and the role of these artefacts and its value in design studio culture. As Sellen and Harper (2002) showed in their work—The myth of the paperless office—that the value of a physical artefact such as paper is its materiality and affordances which allows for mobility, portability, sharability, that are not easily substituted by a new digital paper technology. There is a value in sustaining the sanctity of a material artefact and a technology should build on these material qualities and not replace them. More importantly, in the design studio culture, design artefacts are both the ‘product’ and the ‘process’ of a joint design endeavour. Hence, any technological intervention cannot isolate a designer’s interaction from these design artefacts themselves. Hence, we propose the design of a ubiquitous computing technology that can utilize artefact-mediated interaction. There are existing approaches and technologies that support artefact-mediated interaction in non-design studio settings. The internet of things (IoT) approach (Floerkemeier et al. 2008) attempts to augment physical or non-digital objects with computing capabilities (memory, processing, request handling). In addition, IoT approach also focuses on allowing these non-digital objects to intelligently communicate and dynamically develop network amongst themselves. In the literature, there are several applications that follow this approach. For example, with the goal to leverage discussion in a community, the ToTEM system puts the object itself in the focus: users may tag arbitrary artefacts or use existing codes in order to link electronic memories with the artefact (Barthel et al. 2010). It is possible to take the IoT approach into the design studio culture where each design artefact knows how they are connected to one another. In this case, existing technology that uses RFID or barcodes (Want et al. 1999) or specialized memory infrastructure (Ständer 2010) can be used to support design studios. Utilize spatial resources. The way designers keep these artefacts and organize them in their workspace affects their work organization, communication and collaborative practices. It is this spatial flexibility of, for example, sticking sketches and drawings on a shared office wall, that allows designers to discuss, criticize and explore new possibilities of their design work. In order to provide technological support for spatial flexibility, we need to think beyond desktop computers and involve the spatial and dynamic aspects of design studios, as shown in (Klemmer et al. 2008; Dillenbourg et al. 2008). The importance of physical space in supporting communication amongst designers and easing up the cognitive load, stimulating creative and inspirational thinking and supporting flexibility and portability of organizing work should not be ignored while designing a new technology. Additionally, in particular to the design studio culture, the spatial resources are frequently managed by designers to support certain design activities such as design reflections, group criticism and brainstorming. A desktop-based technology may not be sufficient to satisfy these needs that use space as a highly valuable resource. It was clear from our fieldwork findings that physical space is a part of designers’ everyday work. In connection to the previous design implication, artefact-mediated interaction, the use of IoT approach can also add value in utilizing spatial resources of a design studio. With the use of IoT approach, designers can readily exploit the existing spatial resources such as drawing-boards, office walls, and so on that are available in their design studios and still be able to make use of the computational capabilities that are added by the IoT support. With such a use, design artefacts are tagged with either barcode, RFID or other known tagging systems that can be easily incorporated into the spatial resources. Additionally, directions for a new technology can be explored in large collaborative displays or table-top interfaces that combine both physical and digital resources to support designerly communications. Dillenbourg et al. (2008) show a collection of such technologies that can be easily embedded into the existing furniture of design studios, hence do not occupy any additional space and cultural familiarity with objects such as chairs or sofas help users to easily adapt such novel technologies into their everyday work lives. Creative explorations. We observed that designers spend a considerable amount of time in exploring new ideas and concepts by utilizing different techniques and design representations. This nature of designers goes back to the fact that designers use ‘synthesis’ as an approach to problem solving (Lawson 1979a, b). In a co-located situation such as a design studio, spatiality and visibility play an important role to support creative explorations. There is a plethora of multimodal and heterogeneous artefacts and tools designers use based on the needs, preferences and the stage of design. Our fieldwork suggests that for creative explorations, there is a need for an infrastructure that allows designers to capture, integrate and arrange these artefacts. Obviously, this should be done in line with the current practices of designers. There are well developed examples in this domain focusing on specific aspects of design processes, for example interfaces for collaborative drawings (Tang 1991), for creating architecture plans (Underkoffler and Ishii 1999) and for making clay models (Piper et al. 2002). These are some good examples of supporting design explorations; however, we need more work to support a larger array of design practices. In some cases, it might also be important to see and understand where digitization of physical artefacts (such as sketches) will be beneficial. There is a value in associating and connecting different design artefacts. Technological restrictions currently mean that there is little opportunity to associate the digital and physical, but there is no reason to suppose that opening up that possibility would not add value. For example, a card-board model of a design idea can be made richer if it can be linked to other representations such as sketches, story-boards and so on. Similarly, with a new technology, co-designers should be able to attach valuable annotations and background work to these artefacts. With a large heterogeneity, some of the artefacts should be provided specific representation and interaction styles not only because of their multi-modal nature but to support the kind of expression and annotations they carry. Social flexibility. We observed that the use of design artefacts and physical space allowed a level of flexibility in designers’ everyday social interactions. This helped designers to discuss and talk about things anywhere and anytime. We believe that a ubiquitous computing system should not impose social order onto designers; on the contrary, it should allow designers to bring about and establish new practices for design. The technology should not impose tedious and unfamiliar practices for using it; instead, it should be smoothly integrated into designers’ everyday work. Different projects require designers to use different collaborative approaches and methods. Additionally, they do not follow strict protocols or design guidelines. A technology should be able to incorporate this heterogeneity and informality into the design of a collaborative system. Most of the collaborative systems to support design work have focused on the real-time communications by supporting limited modalities (mainly visual and speech). In order for designers to reflect on their work, we need to provide a platform where designers can constructively criticize and build on each other’s work. For this, designers need more than an online chat system. An asynchronous way of communicating and reflecting on each other’s work could also be considered as it may allow more time and space for the designers. Our research showed that collaborative practices of product designers may not be looked at the functionalist point of view. Several activities and methods product designers employ or design artefacts they use and produce during their everyday work may not seem relevant to an outsider but are in fact crucial to their creativity and innovative practices. Our approach towards the design studio culture provided us with a naturalistic view on how an implicit phenomenon such as common understanding is practiced. We provided an account on how designer supports their collaborative practices that go beyond productivity and functionalist measures, within the design studio culture. Our intention for doing this kind of research is to understand and support the ubiquitous nature of everyday design practices. Based on the results of our fieldwork, we provided possible ways forward for designing new technologies. This work was supported by the European IST Programme Project AMIDA (FP6-0033812). This paper only reflects the authors’ views and funding agencies are not liable for any use that may be made of the information contained herein. We thank the Waag Society, Kees Overbeeke, Caroline Hummels, Mark Baskinger, Mascha van der Voort and the master’s students of Industrial Design at Technical University of Eindhoven and University of Twente for participating in our study. Thanks also to Lynn Packwood for proof reading. This article is an extended version of our ECSCW paper titled: Collaborative Practices that Support Creativity in Design. This document can be accessed from the following link 10.1007/978-1-84882-854-4_9.